Take the Route 100 North Fogelsville exit from I-78. Continue on Route 100 for 8.3 miles to the traffic light at the intersection of Route 309. Turn left onto Route 309 North. Continue on Route 309 North for 1.6 miles. Turn right onto Northwest Road at the traffic light at the intersection of Route 309 and Northwest Road (located before the Northwestern Lehigh High School). Entrance to the Northwestern Community Park Recreation Fields will be on your right. There is a sign with a labeled map to the fields along this road. Head North on Route 309. Turn left to stay on Route 309 North at traffic light at the intersection with Route 873. Continue on Route 309 for 6.4 miles. 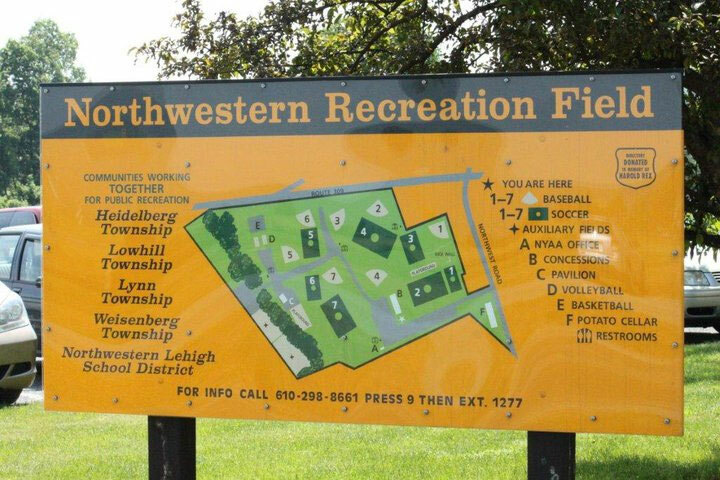 Northwestern Community Park Recreation Fields for Baseball, Soccer and Softball: See maps above or directions at the bottom of page. 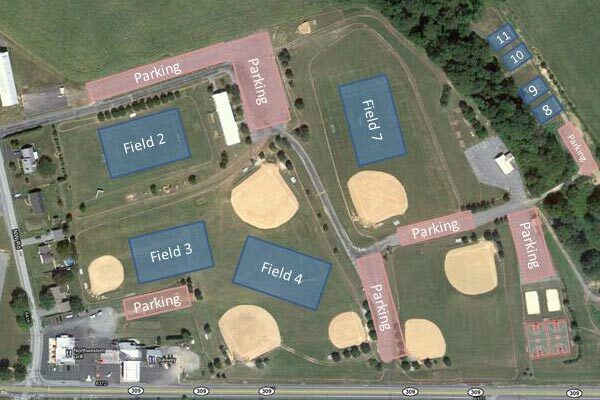 Ebenezer Baseball Fields located behind Ebenezer Church located at 7293 Decatur St, New Tripoli, PA 18066. Ontelaunee Soccer Fields located within Ontelaunee Park located at 7344 Kings Hwy, New Tripoli, PA 18066. - No pets of any kind are allowed at the park. The park is also a smoke-free environment and alcohol is strictly prohibited. - The park is monitored by the Pennsylvania State Police and they make frequent visits. Do not be alarmed if you see a PA State Police car driving through the park. - Please drive slowly around the fields. With over 600 players and their siblings running around, we all need to use extra caution on the roads and in parking areas. - Parking can be sparse around the fields on game days. Carpool as much as you can! Most importantly: Parents, coaches, players and fans, please show sportsmanship and respect at practice and games. Cheer for your team, applaud the efforts of the other team and let the officials do their job. These recreation facilities are managed by the Northwestern Recreation Commission. They can be reached at 610-298-8661.